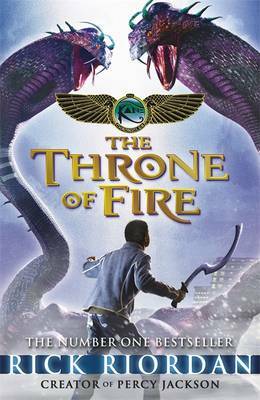 The Throne of Fire: the second book in Rick Riordan's The Kane Chronicles. Ever since the gods of Ancient Egypt were unleashed on the modern world, Carter Kane and his sister, Sadie, have been in big trouble. As descendants of the magical House of Life, they command certain powers. But now a terrifying enemy - Apophis, the giant snake of chaos - is rising. If Carter and Sadie don't destroy him, the world will end in five days' time. And in order to battle the forces of chaos, they must revive the sun god Ra - a feat no magician has ever achieved. Because first they must search the world for the three sections of the Book of Ra, then they have to learn how to chant its spells...Can the Kanes destroy Apophis before he swallows the sun and plunges the earth into darkness ...forever? "Witty and inspired. Gripping, touching and deliciously satirical...This is most likely to succeed Rowling. Puffin is on to a winner". (Amanda Craig, The Times). "Puns, jokes and subtle wit, alongside a gripping storyline". (Telegraph). "Perfectly paced, with electrifying moments chasing each other like heartbeats". (New York Times). Rick Riordan is an award-winning mystery writer. He lives in San Antonio, Texas, with his wife and two sons. Percy Jackson and the Lightning Thief was the overall winner of the Red House Children's Book Award in 2006. The Percy Jackson series: The Lightning Thief; The Sea of Monsters; The Battle of the Labyrinth; The Titan's Curse; The Last Olympian Heroes of Olympus: The Lost Hero; The Son of Neptune; The Mark of Athena The Kane Chronicles: The Red Pyramid; The Throne of Fire; and, The Serpent's Shadow. Like Rick on Facebook or follow him on Twitter.